Finally, fans, my blog is up and running again, with a splendid new play writing project run by Script Space. I have a major problem when it comes to plotting a play - shortage of ideas. Not always, but enough to be a rather obvious drawback, and not a good thing in a writer. However, I have discovered that if you use a story or play that was written long enough ago, or even the life of a real person, the problem can be solved. Which is why I’ve done a modern version of Rashomon, new versions of The Snow Queen and A Christmas Carol for children, an adaptation of Cold Comfort Farm, plus plays about Cinderella, Joseph, the landlady of someone who might be Jack the Ripper, and the executioner of Joan of Arc. I have plans for Matthew Lewis’s sensational The Monk, and Eva Braun, Lizzie Borden and Ed Gein are on the back burner (I do like a touch of the macabre). Of course I’ve written plays which are entirely my own invention, but I really like taking an old theme and re-working it. I saw Maeterlinck’s Bluebird at Birmingham’s Old Repertory Theatre when I was a girl (Trivia - a woman who was in it, also as a girl, is now, fifty years and two hundred miles later, a good friend. Strange are the ways ... ), and it stayed at the back of my mind until now, when I suddenly thought I’d like to have a go at it. It doesn’t get performed very often nowadays - and on reading, one can see why - but I managed to get hold of two filmed versions to see what others have done with it. The story is about two children called Tyltyl and Mytyl (everyone seems to be called Tyl something) who go on a quest for the Bluebird of Happiness. They take with them personifications of the Dog, the Cat, Fire, Water, Bread, Milk and Sugar, and are guided by Light. They visit the Land of Memory, the Palace of Night, the Wood, the Palace of Luxury and the Kingdom of the Future, and finally return home empty-handed, having learned life lessons on the way. But guess where the bluebird was all the time. The first film I watched was directed by George Cukor and starred Elizabeth Taylor, quite a few big names and various Russians. It ran into a great deal of trouble during filming, mainly because one side was Russian and one side was American and neither could understand the other. Not a good start. If you want a film that’s suitable for children, this would probably fit the bill, but if you’re looking for something magical and metaphysical (which was the original intention - Maeterlinck was a student of Swedenborg), this isn’t it. I do remember enjoying the play a great deal when I saw it, but age brings wisdom and I think now that Maeterlinck may have known his stuff when it came to philosophy - and there is an interesting treatise on the symbolism of The Bluebird by Henry Rose available online - but he wasn’t terribly good at constructing a play. The scenes don’t follow in any coherent order and he has far too many extraneous characters. The whole thing needs tightening up. Cukor’s film is, frankly, awful and he should be ashamed of himself. All the magic has been wrung out of it, there is no real message and half the characters are redundant (more Maeterlinck’s fault than Cukor’s, to be fair, but it could have been altered). Miss Taylor is woefully badly cast. As the Spirit of Light, you’d expect something a bit ethereal, but Ms Taylor is solidly built. The animal costumes are ludicrous and the sets flat and dull. Half the time it looks like an amateur stage production with a good budget. However, I found that there was an earlier version made in 1940, directed by Walter Lang and starring Shirley Temple, so when I discovered that a friend had it, I borrowed it. I was amazed. To begin with, Miss Temple is much better than I’d feared. She gives a spirited performance of many moods and carries the film like a true professional. Apart from a small syrupy glitch at the very end, there’s none of the super-sweetness that we have come to associate with her, and at times she is downright nasty. It’s obvious that some thought has gone into this version, and scenes that in the original are somewhat obscure become clearer. This is greatly helped by the removal of all the household objects, retaining only the Dog and the Cat. In my own version, I have reduced it still further by only having the dog go on the journey while the cat prefers to stay at home. I am a cat-lover and get very tired of these delightful animals constantly being portrayed as the essence of evil, so once you've eliminated that element, there is nothing for the cat to do. My only reservation about Lang’s editing is the omission of the Palace of Night, which is one of my favourite scenes, and I think quite an important one if the children are to learn to conquer fears. There are some lovely vignettes when the various Doors are opened and Terrors are revealed as harmless. Characters in a play need a journey, during which they will undergo a change, and Lang understands this perfectly. In the original, the children are feeling mildly discontented because they can’t get enough cake, which is hardly a strong premise. Lang has Mytyl as a thoroughly disagreeable and selfish child, who emerges having learned valuable lessons in sharing and caring. He also uses Light properly, making her luminous by the simple expedient of keeping her in a spotlight. Consequently, when she enters, she brings light with her, as Miss Taylor fails to do. Both films make the mistake of introducing songs, although mercifully, they are few. The Bluebird is regarded as Miss Temple’s least popular film, but I think, without having seen much of her previous work and relying largely on hearsay, it might be one of her best. The reason others don’t like it seems to be that the role of Mytyl shows her in a bad light - mean, whining, rebellious and thoroughly unpleasant - far removed from her previous sweet girly roles. She was also doing the unforgivable - growing up - which doesn’t seem to have gone down at all well with those who loved her just the way she was. I have news for the world. Sylvester Stallone can act! I’ll just run that by you again. Sly is more than big biceps and a sneer. Both he and Schwarzenegger have astounded us all by transcending their muscle-bound, monosyllabic images and developing into genuine actors with considerable charm. ‘Oscar is a farce set in 1931, sort of Damon Runyon meets Feydeau,’ according to director John Landis. ‘I shot the picture in a deliberately stylised manner, attempting a thirties Hollywood comedy look and feel. The film is directed as if it were a film of that time, with humour and dialogue delivered in a manner reminiscent of old Hollywood comedies, particularly the ‘screwball’ genre.’ Possibly this was the problem for some of the more waspish critics. I’ve been a fan of Arnie’s since Conan, but had never been very keen on Mr Stallone, thinking that Rocky was all he was capable of. I was later quite impressed with his performances in Judge Dredd and Cliffhanger, but the film that did it for me was a rather obscure comedy called Oscar. I can’t remember now how I came across this little gem, and I don’t know why it hasn’t received better reviews, but it held me spellbound and beaming all the way through. Based on the Claude Magnier stage play, it is a remake of the 1967 French film of the same name, but the setting has been moved to the Depression era New York City and centres around a mob boss trying to go straight. It begins with Stallone as the gangster, ‘Snaps’ Provolone, being summoned to the bedside of his dying father (Kirk Douglas) and made to promise to go straight. Snaps, in his own way, is a man of honour, and determines to keep his promise, against mounting odds. He arranges to pay a substantial sum to a banking firm if they will take him onto the board of trustees, but on the day of the crucial meeting, the police and a rival gang decide to swoop on his mansion. The plot is true farce, and you just have to accept it as such and go along with all its comings and goings, mistaken identities and frequently-exchanged bags. It’s quick, slick, beautifully presented and exquisitely choreographed, with spot-on costumes and hairstyles, and some charismatic performances, not least from Stallone himself. He plays the father of a spoiled daughter (Marisa Tomei) who is dying to leave home and sees marriage - to anyone - as the only way out, and he plays it with charm and confidence, leaving you gasping with admiration as he struggles to keep control of events. Both he and Schwarzenegger were at their peak at this time and revealed an unexpected flair for comedy and a deal of personal magnetism. Of the rest of the cast, it’s hard to recommend one more than another. I particularly like Martin Ferrero and Harry Shearer as the Finucci brothers, Provolone’s tailors, who move as one and are so proud of their work that all they see in a photograph of a murdered gangster is the quality of the suit they made for him. This is a film I can watch over and over. You can buy it on Amazon for well under a fiver, and it’s a total bargain, but if you’re really cheapskate, you can get it on You Tube. But who wouldn’t want their own copy, to watch from the comfort of their sofa on a chilly winter evening with a nice Italian? You think you have a small garden? You ain’t seen nothing. 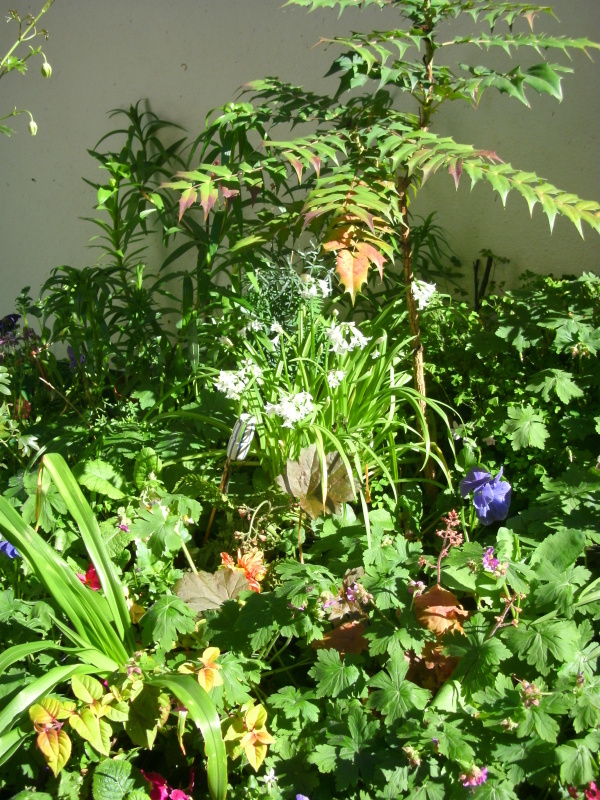 This is a small garden. I’m used to bigger, of course; my previous garden was seventy five feet long and I worked every bit of it, from the rockery near the French door to the soft fruit and compost heap by the shed at the end. Gardening is one of those jobs which is never done, no matter how much time you devote to it; I’d go outside on a Sunday morning to plant the sprouting potatoes from the bottom of the vegetable rack and not come in till tea time. 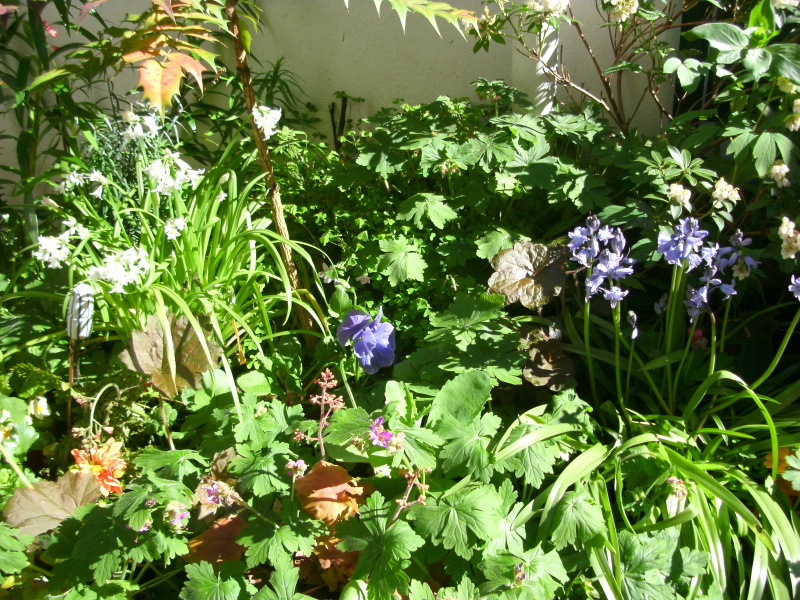 I don’t know how I did it, with a full time job, which is probably why when we moved to a cranky old town cottage near Exeter that had no garden at all, I thought I wouldn’t mind giving it up. I didn’t think I’d miss it. There was a garden round the back which belonged to next door and was nice for the cats to enjoy the sun, but that was all. But gardening is as addictive as nicotine. 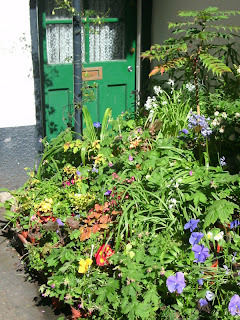 A gardener must grow, and a cottage without flowers is unthinkable, so one day, I put a pot of traditional red geraniums outside the front door. It looked nice and bright, so presently I added a few more. The adjoining house had been empty for some time, but as soon as Soo moved in and put a flower pot of her own outside her door, a garden mysteriously began to grow. 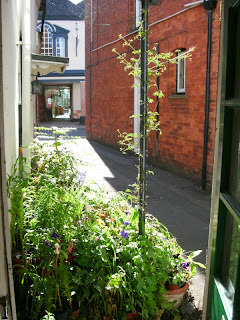 We became guerilla gardeners. 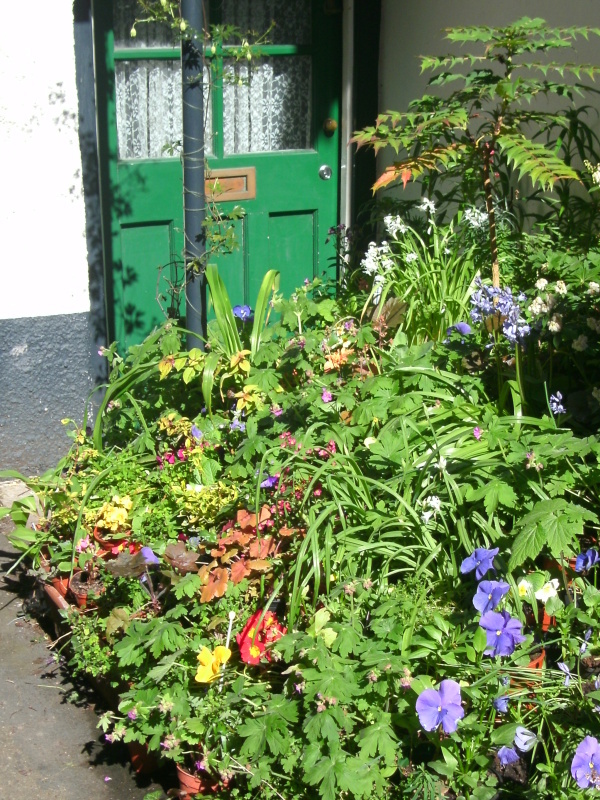 If you’ve never heard of them, they are people who make a garden on a piece of land that doesn’t actually belong to them – motorway verges, waste ground and, as in our case, part of the street. We found that simply occupying the ground wasn’t enough – we had to go higher. At least, I did. Soo was happy to remain at ground level, but I started stacking pots on top of more pots and paint tins and biscuit tins, and eventually got Ray to install a long shelf at the back for greater height. Soo and I have very different gardening styles. 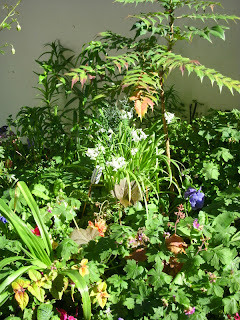 She is tidy and her plants are never more than twelve inches high, whereas I believe that more is better, so I have masses of leaves for my plants to grow through and some of my lilies and Japanese anemones are nearly as tall as I am. I always over-buy and have to pack plants in as tightly as they will go, so they don’t all survive, but nature does her best in spite of me. It’s an amicable arrangement and our differing styles work well – Soo’s low-lying garden leads the eye up to my over-abundant foliage in a pleasing sweep. We are not greatly adventurous in our choice of plants. We’ve tried all sorts over the years, but the road is narrow and consequently only gets a couple of hours of sunshine per day. On breezy days, it’s like living in a wind tunnel, so they have to be good survivors to live there. Mostly we stick to what we know will grow and not disappoint us - begonias, pansies, geraniums and until its recent decline, the radiant busy lizzy - with only the occasional foray into something a bit exotic. Our pineapple lilies were a great success and attracted considerable attention. I’m a big fan of lilies. I always thought they would be too delicate for my ham-fisted methods, but they are the easiest and most delightful plants in the world – put them in, watch them grow - and look spectacular. ‘Our estate’ takes more maintenance than you’d think. As with all gardens, there’s always something that has to be cut back or has grown too tall and needs moving, or a gap that has appeared and needs another plant. Even watering takes a while, and washing up and vegetable cleaning water gets thrown onto it. The biggest problem is the slugs. They love the haven provided by all the pots and I fear I have to waive my principles and use pellets when they get too rapacious and eat something I’ve only just put in. Twice a year we have a mighty Sunday clear out. It has to be a Sunday, because once you’ve got everything spread across the road, you don’t want someone deciding to get his car out. In early spring we take out all the dead plants and replace them with bulbs, and when they’re finished, they come out to make way for the summer flowers. We started out just doing it for ourselves, but then people began to admire it, so we tried that little bit harder, and I have to say, from spring onwards, it does look rather nice. It’s only a few feet away from the main road, and people regularly stop and take photographs. We can see them from our window, pointing and snapping, and once even had a lady standing in front of our door to have her photo taken. I like to think that there are pictures of our garden all over England, and who knows, maybe the world. We never get tired of the gratification it gives us, and the friends it makes us as people go by; some people make detours just to come and see it. 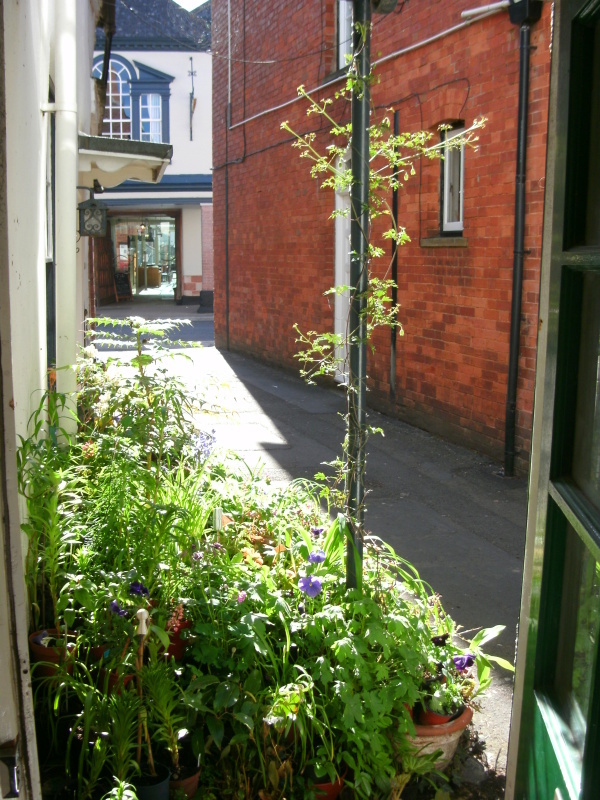 Topsham is very keen on its gardens and the bigger ones are open to the public in the summer. Ours, we say proudly, is open all year round and it’s free. When we lived in suburbia, gardening was a solitary pursuit conducted in secrecy behind well-trimmed hedges, but having an open garden in a small town means that you’re constantly stopping for a chat. 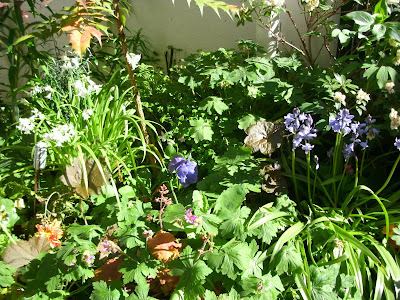 We’re often asked if the garden gets vandalised. The answer to that is, ‘Not yet,’ which is surprising, considering how easy it would be. We get small gangs of inebriated young men coming up the road from time to time who I’m sure occasionally relieve themselves on it, and I once caught one making off with a surfinia for reasons of his own, but on the whole they leave it alone. I have a book called The Small Garden, which has nice pictures and good ideas, but the author and I differ on what is ‘small.’ He seems to mean something not quite as big as Hidcote, with room for decking, ponds, pergolas and a water feature. I should like him to come and see ours. Perhaps he might revise his ideas of what a really small garden is. Lots of writing competitions have certain restrictions on who and what you should be if you want to go in for them - the Asham wants you to be female; Welsh ones tend to want you to be Welsh; most say you must be over eighteen, unless it’s one for young people, in which case you must be under; some specify what area you must come from or live in, and some have great screeds of rules which you must sign in blood. These strictures may be irritating, but you can appreciate the reasoning behind them. However, I have come across a competition - the H.G.Wells Short Story Competition (see rules and FAQs) - which has the most peculiar condition I have ever heard of. Entrants must submit a typescript of their story accompanied by a hand-written copy which will account for 10% of their resulting marks. I started to think about this. Why handwritten? What was the agenda here? Obviously, we were going to be judged by the quality of our handwriting, but why? I wondered at first if the organisers wanted to use graphology to see if we were fit to go in for their competition, which was worrying, as graphology is known for being unreliable and is not much used to judge character any more. Mercifully, this isn’t the case, although it’s not a lot better. Further investigation revealed that the competition is run by one Reg Turnill, aged 94, who is so appalled by the current standard of literacy that he is taking it upon himself to improve matters. He has run the competition before, stipulating that entries could only be handwritten (and furthermore with a ‘no science fiction’ rule, which seems a bit odd in an H.G.Wells competition). Unsurprisingly, it got no entries at all. Did he learn from his mistake? Not really. He has unbent sufficiently to allow typescript, and says handwriting is not compulsory, but you lose ‘marks’ for bad handwriting. In other words, write it nicely or else. When I was teaching, I would take Handwriting once a week, and I can tell you that some people naturally write neatly and some just don’t, despite endless practice in letter formation, etc. The brainiest writer I know has handwriting that even I, after twenty four years, still can’t read, and everyone knows about doctors. There is another very large and obvious problem with this. What if we are dyslexic or have a manual disability - arthritis, injury, Parkinsonism? Or are Stephen Hawking? I could cite Dennis Potter, who would strap a pen to his hand in order to write. Doesn’t this come under the heading of discrimination on grounds of disability, which I believe is illegal? And we have to ask, could Mr Turnill at the age of 94 do it himself? You could always get a friend to write it out for you, I suppose, but they’d have to be a very good friend to copy out several thousand words, and what if the judges found out? Oh, the shame. You could say that the medium is the message, and certainly any judges would be unimpressed by a story written in green ink on the back of a Sugar Puffs packet, but handwriting is surely a separate issue. Perhaps he should have a handwriting competition and get his message across that way. "Last year’s competition brought in too many stories depicting ghastly invasions of our everyday lives by all sorts of nameless horrors"
So what? Every competition will have its dross and gluts of a particular kind of story, and that’s why there are judges – to pick out the diamonds. Maybe a writer will have a new and original take on a much-used idea. Or why not simply say, ‘Don’t go for the obvious?’ If you’re judging a writing competition, you have to take what comes, and a good story is a good story, whatever its genre. "Stories should give readers in 2110 an idea of what life is like for ordinary people, working or retired, in the second decade of the 21st century - its complications and perplexities, and above all its humorous aspects. HG’s characters described the misery and humour of apprenticeship in a draper’s emporium. There must be both fun and drudgery working in a supermarket or MacDonald’s. Is this or back-packing a better way to fill in the time between college and university? And what is it like if you don’t go to university? Plumbing is said to be a well-paid alternative - and always good for a laugh. And how does it feel to be made redundant - all too familiar in 2010, but hopefully less well-known in 2110? There are plenty of non-sci-fi stories waiting to be written." Cor. I really feel that if this is what he wants, he should be running a different kind of competition. You can’t dictate to the competitors or they will avoid your competition, as they have. There are plenty more they can choose from. In 1994, and probably since too, for all I know, the mighty Bridport competition gave a list in its anthology of the kinds of stories they received all too often. It was daunting, yet helpful because it gave you a good idea of what was becoming clichéd. Bridport is a long-standing and well-respected competition and can do this. Mr Turnill is merely giving his personal views and making it all too clear where he stands and what he will approve of, and I fear he is fighting a losing battle. The obvious come-back to any complaint would be, ‘If you don’t like it, don’t go in for it’, but isn’t that just what people have been doing? HG Wells writing competition demands handwriting, no science fiction; no one applies, Cory Doctorow, BoingBoing, Jul 18, 2010. Mulberry was a TV comedy series in 1993 by Esmonde and Larbey that seems to have been somewhat overlooked. I remembered enjoying its gentle story line, but wasn’t sure if I’d still like it now. So I did what I always do and had a look at Amazon, where I found a two-disc set for well under a tenner. I decided to risk it and get the whole thing, and how glad I am that I did. I’ve always had a sneaking admiration for Esmonde and Larbey, but have only ever admitted to liking The Good Life, an acknowledged classic. Mulberry, however, is way up there with it. It’s an unhurried story about a mysterious young man, Mulberry (Karl Howman), who arrives out of the blue to apply for a job that hasn’t even been advertised yet. The elderly, cantankerous Miss Farnaby (Geraldine McEwan), is a sour recluse who takes him on reluctantly, but gradually comes to rely on him, much to the disgruntlement of her two staff, Bert and Alice (Tony Selby and Lil Roughley). The mystery keeps you wondering. Who is Mulberry and what are his intentions towards Miss Farnaby, who he is teaching about life while taking her out of herself? Who is the sinister stranger who seems to be urging the reluctant Mulberry to kill her? All is revealed by the end of Part 1, much to our relief. Karl Howman as Mulberry is perfect casting. He has immense personal charm and you hope and hope that he’s not going to turn out to be a baddie after all. His scenes with Geraldine McEwan are masterpieces of dialogue and you know she’s going to warm to him eventually. How could she not? I wondered why Geraldine McEwan (who I remember in shorts and crew cut in The Member of the Wedding in the 60s) hadn’t been offered a damehood, and found that actually she had, but declined it. If anyone knows why, I should like to hear. Her Miss Farnaby has an edge of Mrs Proudie and the same qualities that we used to admire in Margot Leadbetter – she’s steely and determined and can dig in her heels like a jack donkey - but she also has Miss Marple’s twinkle and charm. I think that’s the keynote here. The leads have charm. Not false sweet charm, but a kind of innocence. Even the sinister stranger (the divine John Bennett, another perfect casting) has it, in his dour way. The ancillary characters, alas, do not. Bert and Alice are perhaps the weakest. Their bickering sometimes borders on the silly, and their scenes only take off when another character is present. I think the problem with them is that they are just there to be sounding boards, something for the leads to bounce off. They do add to the enclosed feel of the scenes, but they don’t quite work. I’d have preferred more interaction with Miss Farnaby’s sisters, whose scenes do work. Bert and Alice are outsiders. 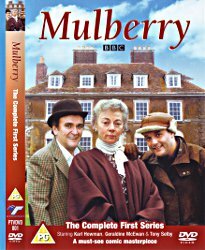 Esmonde and Larbey were very fond of Mulberry and had planned a third series, in which Miss Farnaby understands what is going on. I think this would have been an excellent idea, but unfortunately the Beeb didn’t see it that way and it never happened. Quite often a series passes its natural finish (see Last of the Summer Wine, in which we start getting Compo riding down a hill in a bath for no very good reason), but I think we could have taken a bit more. Larbey appears in an interview - see below - to be quite distressed that we never got the chance. These characters get under your skin and make you want to stay with them for just a little bit longer while the story line winds to its natural conclusion. We are left with a feeling of something incomplete. Clare Girvan is a writer living in the small town of Topsham, near Exeter, Devon. She focuses chiefly on short stories, theatre and poetry. See the CV page for full credits. The header image shows me in the Lyme Regis Undercliff, which Ray and I walked in 2010: see his blog.